Swiss and European food, pharmaceutical and cosmetic firms must tread carefully if they want to tap the surging $1 trillion global halal market with products that are permissible under Islamic law. A Bern-based halal certification service is helping them meet the challenge. The global market for halal products is booming: halal food is estimated to be worth CHF710 billion, with pharmaceuticals and medicine amounting to CHF130 billion (2013 figures), according to the certification service. By 2030, it is expected to grow by 20-25% in Europe alone. A number of big Swiss and European firms are already active in this market, such as Merck, Nespresso, Givaudan, Emmi, Firmenich, Stella, DSM and Lindt. 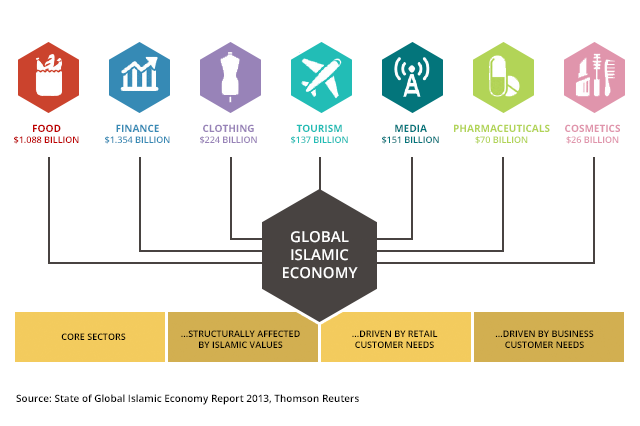 They have been ramping up their investment and expertise as they eye a fast-growing Muslim population that is forecast to add a billion people by 2050 with rising education and income levels. Today, 85 out of Nestle’s 456 factories around the world have a halal product licence worth CHF5.3 billion, or 5% of its total sales. To win over Muslim consumers, many Swiss and international companies are keen to obtain a halal certification for their products. But this can be a complex process, involving numerous regulations and rigorous assessments. The lack of unified standards and agreement between halal certification organisations can also complicate matters. Since 1994, the Bern-based Halal Certification Services company has been assisting “ingredients, food products, pharmaceutical and cosmetic manufacturers to cater the halal market needs”. According to Mohammad Tufail, a Pakistani surgeon who founded the company, certification is based on a scientific definition: “any product that does not contain anything that contradicts Islamic laws”. The company now employs over 25 Muslim food and nutritionist specialists and has provided halal certificates to over 200 companies around the world. At its most basic, a halal product means food and drinks that do not contain any alcohol or pork. “It is every drink which is unhealthy or which contains blood liquid or alcohol. Anything edible that is unhealthy or whose source is meat-eating animals, such as pigs, and other wild animals,” Jawad Alzeer, a professor at the University of Zurich and a certification expert, explains. But it can also cover cosmetics, drugs and pharmaceuticals, as well as everything that enters a person’s stomach or body, regardless of their different forms. Granting or refusing a halal licence is not simply a religious judgment, but is based on ethical standards, mainly quality. “For the product to be halal, it must be of high quality and must not pose a hazard to the health of consumers,” explains Dr AbdelHak Mansouri, a nutritionist at the federal technology institute ETHZ. Another ethical criteria is respect for the culture of the consumers and society. Halal Certification Services says it can refuse a certificate if a firm manufactures poor products or does not respect workers’ rights, or health and safety standards, for example. The fact that Halal Certification Services operates out of Switzerland is a sign of its professionalism and has helped it stand out from the crowd, the specialists say. Depending on the production process and its complexity, the certification team carries out one or more visits to a manufacturing firm, sometimes without prior warning. There they assess whether the firm is able to ‘translate the concept of halal’ into objective scientific concepts and methods agreed by all, Mansouri explains. Swiss expertise and high quality infrastructure have helped enhance the process and ensure its transparency and integrity. “The advanced technology and sophisticated techniques help ensure the safety of products and the effectiveness of the assessment and the correctness of the decision based on it,” says Tufail. Although they have expertise and a clear vision, Halal Certification Services still encounter numerous challenges and questions when dealing with the fast-changing environment of the global food industry. For example, some people in western countries believe insects could provide an important future source of protein. But can you eat insects under Islamic law? The issue is still under debate. And how can you prove that the tiny food particles that might end up in some food products came from an animal that was slaughtered in a manner compliant with Islamic law? This can be particularly difficult to prove when they are so small and undergo complex transformation processes before being used, says Alzeer. Mansouri says future technologies may hold answers to some of these questions. In Malaysia, for example, they have found a way of analysing the proteome that can distinguish between the animals that were stunned before slaughter and those that were not. But he admits that such techniques remain extremely costly.